Yerba Buena Island sits in the San Francisco Bay between San Francisco and Oakland, California. 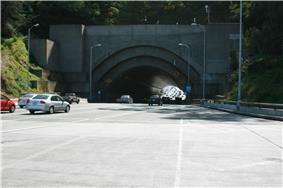 The Yerba Buena Tunnel runs through its center and connects the western and eastern spans of the San Francisco–Oakland Bay Bridge. It has had several other names over the decades: Sea Bird Island, Wood Island, and Goat Island. The island is named after the town of Yerba Buena, which was named for the plant of the same name that was abundant in the area. The plant's English and Spanish common name, Yerba buena, is an alternate form of the Spanish hierba buena (literally meaning "good herb"), generally used to describe local species of the mint family. 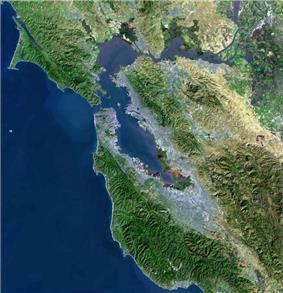 The island is currently part of District 6 of the City and County of San Francisco. According to the United States Census Bureau, Yerba Buena Island and Treasure Island together have a land area of 2.334 km2 (0.901 sq mi) with a total population of 2,500 as of the 2010 census. Today the military reservation southeast of the Yerba Buena Tunnel belongs to the United States Coast Guard (USCG) District Eleven. The US Coast Guard Sector San Francisco – Vessel Traffic Service (VTS) tower is located on Signal Road Bldg. 278 atop the peak of the island. The US Coast Guard Sector San Francisco Headquarters is co-located with US Coast Guard Station San Francisco on Healy Avenue @ Fresnel Way at water-level on the southeast coast of the island. The USCG Station has a navigational buoy repair facility on Fresnel Way. The USCG Senior Officers' residences are in Quarters A, B, C, 8 and 9 off of Hillcrest Road on the hill atop the USCG base. During the summer of 2011, the Department of Homeland Security - United States Coast Guard opened the new SAFE Port Act (2006) Interagency Operations Center (IOC at Bldg. 100 site on Spindrift Circle) on the US Coast Guard Sector / Station San Francisco base. The IOC houses the VTS, WatchKeeper and the US Coast Guard Sector San Francisco Command Center together in one building. 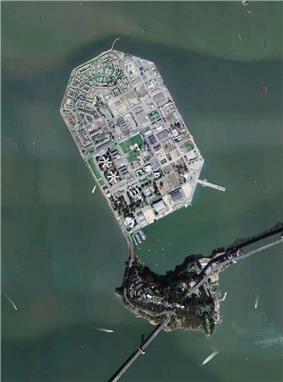 Aerial photo of Treasure Island (top) and Yerba Buena Island (bottom). The first California legislature, on February 18, 1850, passed an act establishing the boundaries of San Francisco County and naming the island after the former name of the city of San Francisco, Yerba Buena, which was changed in 1847. Officially, the island was Yerba Buena Island until 1895, when on a decision by the United States Board on Geographic Names, it was changed to Goat Island. During the gold rush, a large number of goats were pastured on the island, and the name "Goat Island" came into popular use. It was changed back to Yerba Buena Island on June 3, 1931. The idea of a military post on Yerba Buena Island originated during the American Civil War, when it was feared a raiding Confederate warship could slip past Fort Point and Alcatraz Island during a foggy night. However, it was not until the 1870s that Army Post Camp Yerba Buena Island (aka Army Post Camp Decature aka Army Post at Goat island aka US Engineer Depot, Yerba Buena Island and aka US Quartermaster Depot, Yerba Buena Island) by Navy Road and North Gate Road was completed, including a fog signal and octagonal lighthouse called Yerba Buena Light (1875) that remain today at the end of Hillcrest Road. In 1891, the United States Army Engineers (Currently known as the United States Army Corps of Engineers) built a Torpedo Station / Shed / Storehouse / Assembly building (Building 262) at the end of Army Road by North Gate Road. The torpedoes were actually floating mines that could be placed in the bay via cable for defense against intruding enemy vessels. The Torpedo Station was abandoned in the 1930s but still stands today (hidden underneath the San Francisco-Oakland Bay Bridge) listed in the National Register of Historic Places. Just before the turn of the 20th century, the first U.S. Naval Training Station on the Pacific Coast was established on the north east side of the island by 1st Street and North Gate Road. Quarters One, also known as the Admiral Nimitz House near the intersection of Whiting Way and Garden Way, was built about 1900 as the Naval Training Station commandant's residence. Its Classic Revival style, fashionable for private residences in the Bay Area at the time, was unusual for naval base housing. The training station closed after World War I. Although the training station closed the Navy maintained presence with the stationary receiving ship USS Boston (1884) aka USS Despatch (IX-2) (1940) anchored in harbor through World War II. During World War II, Yerba Buena Island fell under the jurisdiction of Treasure Island Naval Station, main headquarters of the 12th Naval District inside Building One. Built on the shoals of Yerba Buena Island, the 403-acre (163 ha) Treasure Island was a Works Progress Administration project in the 1930s. After hosting the 1939 Golden Gate International Exposition, the United States Navy deemed Treasure Island an ideal location for transporting people and machines to the Pacific theater, and on April 17, 1942, established Treasure Island Naval Station (for surface ships and submarines) and as an Auxiliary Air Facility airfield (for airships, blimps, dirigibles, planes and seaplanes) which also included a portion of Yerba Buena Island. Quarters One became the residence of the Commander in Chief, US Pacific Fleet (CINCPACFLT). Several other buildings used by the Naval Station during World War II also remain on the island, including the Senior Officers' Quarters in Quarters A, B, C, 2, 3, 4, 5, 6, 7, 8 and 9. Buildings 83, 205 and 230 were support facilities to the senior officers' quarters. 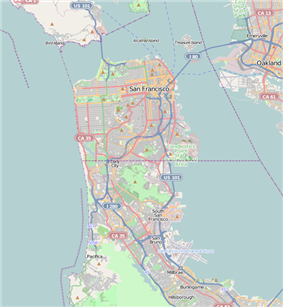 In 1996, the naval base and the Presidio of San Francisco were decommissioned, and opened to public control, under stipulations. Quarters One by Whiting Way and the other Senior Officers' Quarter by Garden Way are listed on the National Register of Historic Places. The SFPD took over law enforcement jurisdiction of non USCG parcels of Yerba Buena Island. SFFD Fire Station 48 on Treasure Island took over medical rescue & fire protection of Yerba Buena Island (including USCG Sector / Station San Francisco) and portions of the San Francisco–Oakland Bay Bridge. Located west of the island was Blossom Rock, a treacherous submerged rock that lay only 5 feet below the surface of the water at low tide. Blossom Rock was discovered and named in 1826 by Captain Beechey of the HMS Blossom. Beechey noted that the rock could be avoided by aligning the northern tip of Yerba Buena Island with two especially large redwood trees growing in the East Bay hills as one entered the Bay. These redwoods were located in what is now Roberts Regional Recreation Area, near the "Madrone" picnic area; the area is marked with a historical marker. The "Navigation Trees" were logged in about 1851, exacerbating the danger of Blossom Rock. The top of the rock was blown up in 1870, and another section removed by blasting in the early 1930s. There are three parks located on Yerba Buena Island. Hill Park near Treasure Island Road and Macalla Road which used to be a military cemetery until the high visibility traffic approach to the 1939 Golden Gate International Exposition necessitated its removal and transfer of graves to the San Francisco National Cemetery in the Presidio of San Francisco. With Blue Park and Tower Park atop YBI by Yerba Buena Drive. In his book Two Years Before the Mast, published in 1840, Richard Henry Dana, Jr. mentions in the last chapter, actually a post script chapter added 20 years later, that his ship of the 1830s voyage anchored "between a small island, called Yerba Buena, and a gravel beach in a little bight or cove of the same name". Treasure Hunting on Yerba Buena Island: San Francisco's newest neighborhood to be landscaped with locally appropriate native plants. United States Navy, World War II, Chief of Naval Operations, Philippines, Washington, D.C.